“If you really want to make a friend, go to someone’s house and eat with him. The people who give you their food, give you their heart” .. Does this strike a chord with you?? If you a regular here you must know that I am an emotional cook . As far as I am concerned “Food is Memories”. There is nothing more fun to me than sharing a good meal with some great friends. The laughter, the inevitable joy , the openness, the understanding that comes from having good friends is PRICELESS! This has happened to me all too happen..and in all probability to you too. One day when I took out my camera to take pictures of the food in a restaurant, people stared..Then I saw another girl giving me a BIG broad bright smile ..there was the same light in her eyes that I have when I am shooting, making ,talking or writing food! I knew she was a kindred soul…and just like that a new friendship was born. Friendship – That is the very reason I am delving into this new mad world of blog hopping. Consider it a virtual potluck party, only instead of meeting old friends, you will also make great new friends!! That in my world is a total win-win. But its not just about that..Blogging is also a difficult and time consuming job. Most people don’t realize that we work around the clock..its only the other bloggers who understand what you are going through. 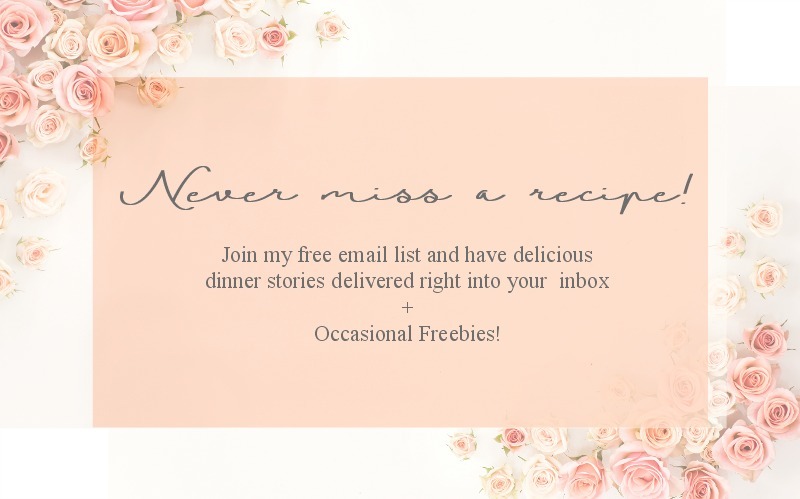 By the help of this party, I am trying to get us all to meet up, share our amazing posts (food or DIYs) , hop onto each other’s blogs and leave some comments. You know every little comment helps bring a smile to your face. Recently when I migrated from blogger to wordpress and lost ALL my former comments ,I was CRUSHED. Yes, there is no other word..10 months of wonderful comments all gone! So I know the value of that little comment..and I want to bring a smile to other blogger friends by showing them some love. Do NOT be afraid of showing some love. In this dog eat dog world, its not rivalry that keeps us alive. Its the feeling of belonging to a community, a peer group, a friends circle, that bonds us and gives us the strength to do what we do, day in,day out. So, lets all make this party fun.. People from all around the world are welcome to my little space here to link up their awesome blog links and meet some other great people. I hope you will help me in making this new endeavor a success..and of course have fun while we are at it.. So what do you say… Let’s get the party started, shall we?? Don’t forget to visit my amazing co-hosts and follow them too! This is a link party for all food, craft, and DIY bloggers. Lets meet the hosts of this fabulous link party! Jennifer from Take Two Tapas. Swayam from La Petit Chef. Dini from The Flavor Bender (formerly known as Giramuk’s Kitchen). 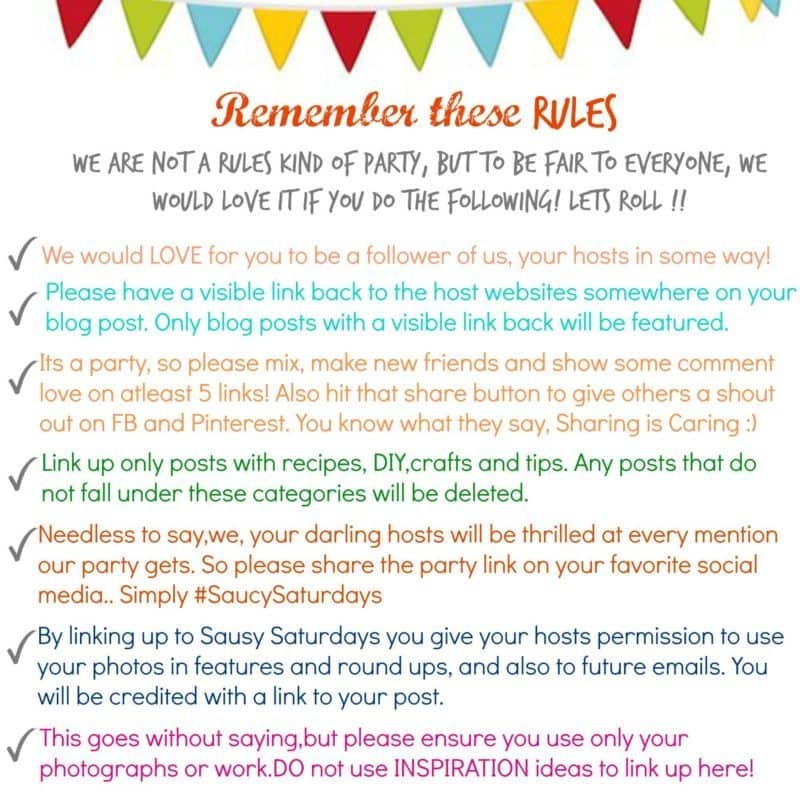 All links will be Pinned to our Saucy Saturday Pinterest Board and from there to even bigger boards by the hosts!! Please make sure you follow us. 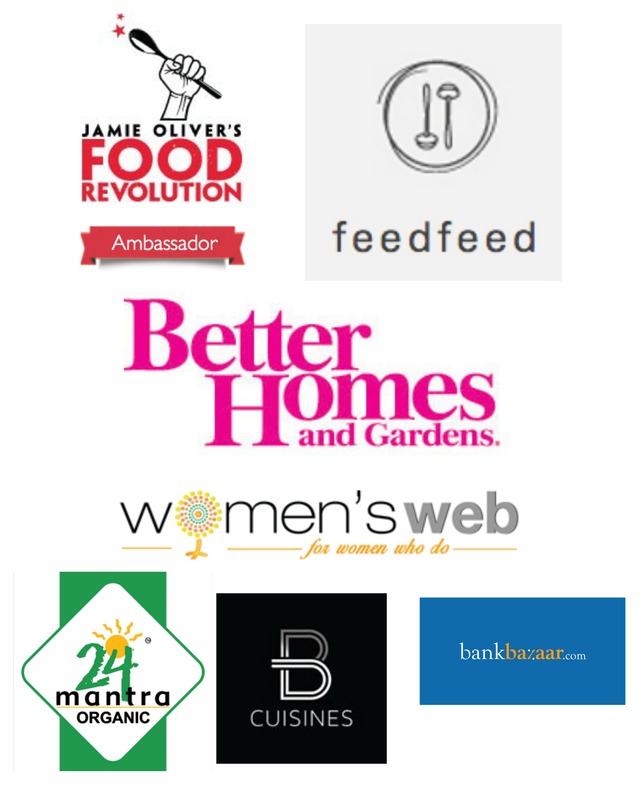 The 5 FEATURED links will be shared by all the hosts across all Social Media, every week. The party is open till Wednesday morning, So link up all you want and do spread the word! Start Linking … Simply click on the ADD LINK tab below, It will take you to an Inlinkz page, Once there, add the blog post link and press enter, Choose a pic and press DONE. “Click on take me back to the same link up” if you wish to add a second post. Grab our link party badge for your sidebar to help us promote #SaucySaturdays! Enough of the rules, on to the party! Julie this is all kinds of delish…you have got me craving for it now..and its after midnight here!! Great linky party, thanks for inviting me! Thanks for coming over Jacqui!! I’ll be linking up in a minute … but I had to say …when I read the part in your post that says: “Consider it a virtual potluck party, only instead of meeting old friends, you will also make great new friends!! That in my world is a total win-win.” THAT! struck a chord with me!! I love potluck parties. I love friends. I love sharing. I totally agree with this sentence and thanks to you for this win-win. what a party dear ! 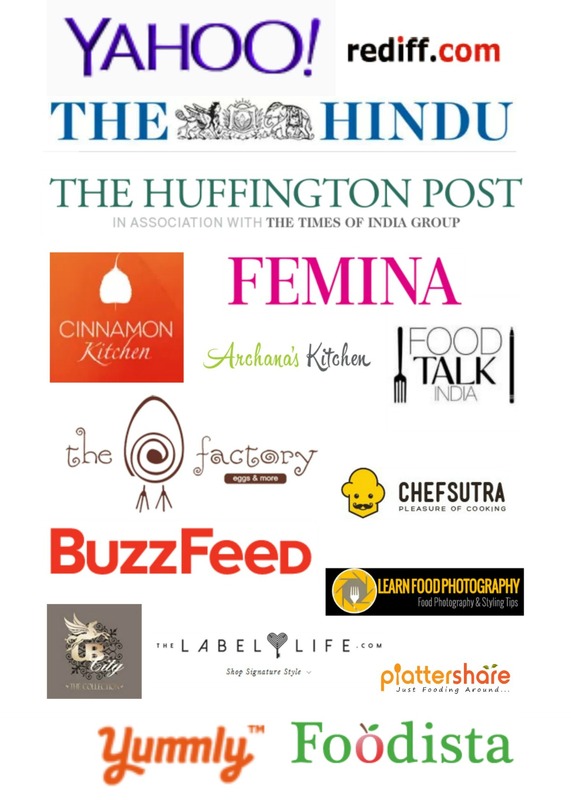 i never imagined so many exiciting food stuff in one page with such lovely friendly gesture n words ! though I am not an avid blogger or foodie , my connection with all u happily partying people will be in enjoying ur food in photographs ! 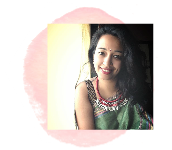 of course d best part i like in this blog is Swayam’s cordiality n delicious, yummicilious ,(in ur foodie lingo ) writing, which i devour with such pleasure ! Hi swayam I am not able to link.I have put permalink.Still.Any thing which i might be overlooking? Finally I linked to the party.There is definitely some issue with the badge.Please check it out.and thanks for thsi linky party. Thanks so much ALka!!! Sure.. please link up on saturdays as we go live from Saturday to Tuesday midnight! !